You don't have to travel very far from the epicentre of power in India to grasp the challenge of urban governance. Take a walk to Delhi's hip and happening Khan Market. Watch the BMWs squeeze their way in, and the glitzy crowd walk quickly from chauffeur-driven car into fancy restaurant or fancier boutique, noses covered with handkerchief! There is no experience more sobering for the perfumed than a walk down the inner lane of Khan Market - it stinks. Khan Market has become the latest metaphor for private wealth and public squalor in urban India. 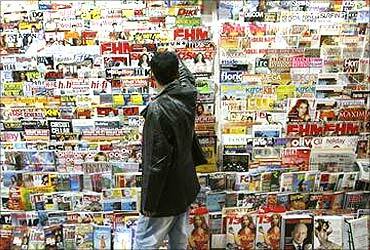 Image: A customer at Khan market. If New Delhi's central government is unable to address the challenge of urban governance next door, and is not willing to empower the chief minister of Delhi, forget about the titular mayor of Delhi, how can one expect a new 74th Constitution amendment bill type of intervention to make a difference to urban governance, when the old one has made hardly any difference to rural governance?! However, a report of a 'high-powered expert committee on urban infrastructure and services' (HPECUIS), chaired by Isher Ahluwalia and including some very knowledgeable persons, sees such a legislation as key to addressing the problem of urban governance, which the committee calls "the weakest and most crucial link, which needs to be repaired to bring about the urban transformation so urgently needed in India." 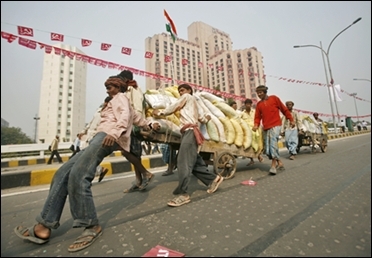 Image: Labourers try to slow down a hand cart loaded with sacks of sand at a flyover in New Delhi. But the JNNURM failed because a weak coalition government in Delhi was unable to impose reform on unwilling state governments that were quite happy to take the money and not pay much attention to reform. How an even weaker central government will now be able to get an assortment of political parties around the country that are still dragging their feet on tax reform to agree to not just "reform", but in fact a transfer of power from the state government to local governments, with empowered mayor and municipalities is not clear. 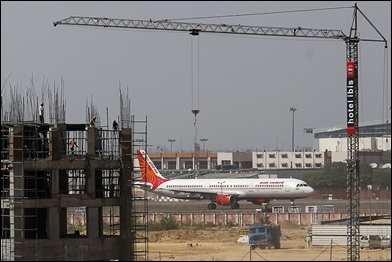 Image: Infrastructure needs huge funds in India. India has a three-tiered governance structure captured best by the statement that power in India revolves around three offices - DM, CM & PM (district magistrate, chief minister and prime minister). Possessed by a fanciful view that New Delhi can administer top-down reform in India via legislation, the Rajiv Gandhi Mani Shankar Aiyar duo amended the Constitution to transfer funds and powers from Delhi to the districts, bypassing the state capital. Andhra Pradesh's irreverent and irrepressible chief minister of the day, N T Rama Rao, got back with the one-liner - the Centre is a conceptual myth - and showed that any attempt to bypass the state capital will be disastrous for the success of any centrally-sponsored initiative at the local level. Image: Children play in water pipes at a construction site on the banks of the Yamuna River. The initiative for empowerment of local government will have to come from state governments and through public pressure from below. This is the single biggest lesson to have been learnt from the actual experience of the 74th amendment to the Constitution. A highly regarded and knowledgeable member of the HPECUIS, Ramesh Ramanathan of Janaaagraha, Bangalore, has long lamented the delinking of reform from funding in JNNURM. This delinking has happened not because the Centre has no clout with urban local bodies, but because the Union ministry is under pressure to disburse funds even when not much reform is happening on the ground. 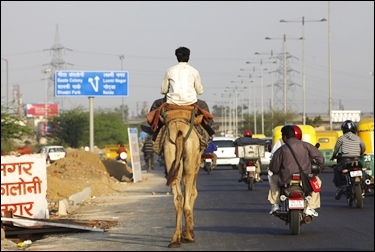 Image: A man rides a camel on one of the main roads in New Delhi. Funds once created are normally not allowed to lapse in government. Not using funds is as much of a crime as misusing them! I am surprised that even Mr Ramanathan thinks NIJNNURM will succeed where JNNURM failed. India's cities do not necessarily lack funds, they lack a political focus that only state governments can provide. To end the ugliness of private wealth and public squalor, India's cities require local mobilisation, not national incentivisation. The key to urban reform and development is to get state governments to push for them. In Uttar Pradesh, it is chief minister Mayawati, who is finally driving urban reform. 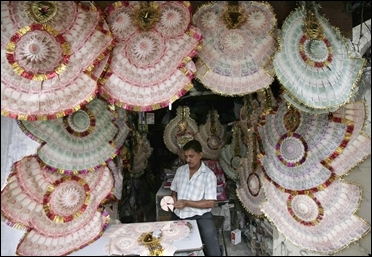 Image: A shopkeeper staples Indian currency notes to make garlands at a market. If UP's cities develop, it will be because of chief ministerial leadership, neither the incentive of funds from Delhi nor the incentivisation of local government leadership. Hyderabad offers a good example of a city that improved rapidly under chief minister Chandrababu Naidu's leadership and has since deteriorated due to the neglect of a successor government that shifted its focus away from the city to the countryside. In fact, in this case the Union urban development minister was from the same state and a resident of the city, and was implementing JNNURM. Yet, Hyderabad saw little governance reform, and instead experienced deterioration of urban services. 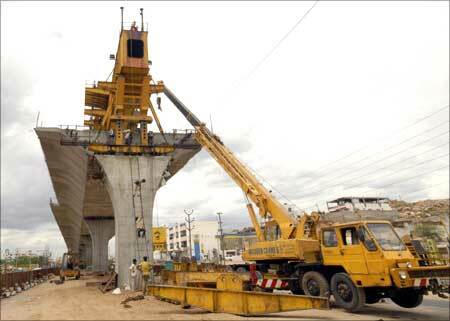 Image: Labourers work at a flyover undergoing construction in Hyderabad. Almost all the ideas in the HPECUIS are very good. Indian cities need better governance, better services, more investment, etc. etc. A lot of the suggestions made in the report are useful and will help. But if urbanisation in India has to move forward there can be only two ways forward -either the central government takes over an entire city (as has been the case with New Delhi and Chandigarh, and such an option has been suggested before for Mumbai and, more recently, for Hyderabad); or, state governments get involved in urban development, as happened in Andhra Pradesh with Mr Naidu, and more recently is happening in UP with Ms Mayawati. The HPECUIS view that central funds and Constitutionally-empowered local leadership, trained by Indian Institutes of Urban Management and such like institutional interventions from Delhi, will transform Indian cities appears fanciful. 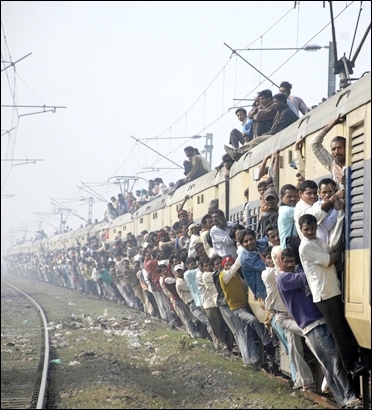 Image: Passengers travel in an overcrowded train in the eastern Indian city of Patna.